Olivier Salad (салат Оливье) is a Russian Potato Salad is enjoyed at every Russian celebration dinner, especially for Christmas and New Year celebrations. Just like another famous Russian salad, Herring Under a Fur Coat, it takes time to prepare these delicious salads. You’ll find versions of Olivier Salad all over the world. Popular in Eastern European countries, Poland, Spain, Greece, Turkey, Pakistan, Israel, Iran and even in Latin America! It’s known as; руска салата, Bramborový Salát, Ensaladilla Rusa, Salada Russa, Rus salatası, Ensalada Rusa. The common thread for most of these names is that it translates as Russian Salad. Olivier Salad, pronounced as Olivye in Russian, has been since the 1860’s. This Russian Salad was invented in Moscow by Lucien Olivier, but it was made very differently from the modern Olivier of today. The original recipe had crayfish, smoked duck, caviar, and grouse. The original recipe was a guarded secret. In post revolutionary Russia, the recipe changed to more easily accessible ingredients. The expensive and rare ingredients made way for eggs, green peas, pickles, cucumbers and meat. The traditional Soviet meat used was Doktorskaya sausage, which is like a bologna. We usually make this recipe with Ham, especially leftover ham from Christmas. I make a Coca-Cola Ham, and there is always lots left over. It’s the perfect way to use leftover ham, just in time for New Years. Olivye is also made using boiled chicken. I’m not a fan of boiled meat, but smoked chicken works really well. Ham steaks are a good alternative they are easy to cut. The hardest part of this recipe is cutting ingredients all the same size. It’s a lot of work! Here’s a tip! I recently bought an Onion Chopper which works amazing! It’s so easy to dice anything perfectly with one quick swoop. The chopper is such a time saver and gives the salad a uniform look required. Be careful not to overcook the potato and carrots, as they will mush through the chopper. I hate mushy Olivier! As I mentioned before, Olivier Salad is made to celebrate the New Year. Here in Australia, that’s in the middle of our summer. I love adding a bit of fresh cucumber as it gives a freshness and crunch to the Olivier salad. If you add cucumber, remember to de-seed the cucumber, otherwise it will make the salad soggy. Feel free to add more or less of ingredients that you love. This Russian Salad recipe is not just a regular potato salad, but much tastier and worth the effort of making for your next special event, potluck or bbq! Bon Appetit! Приятного аппетита! 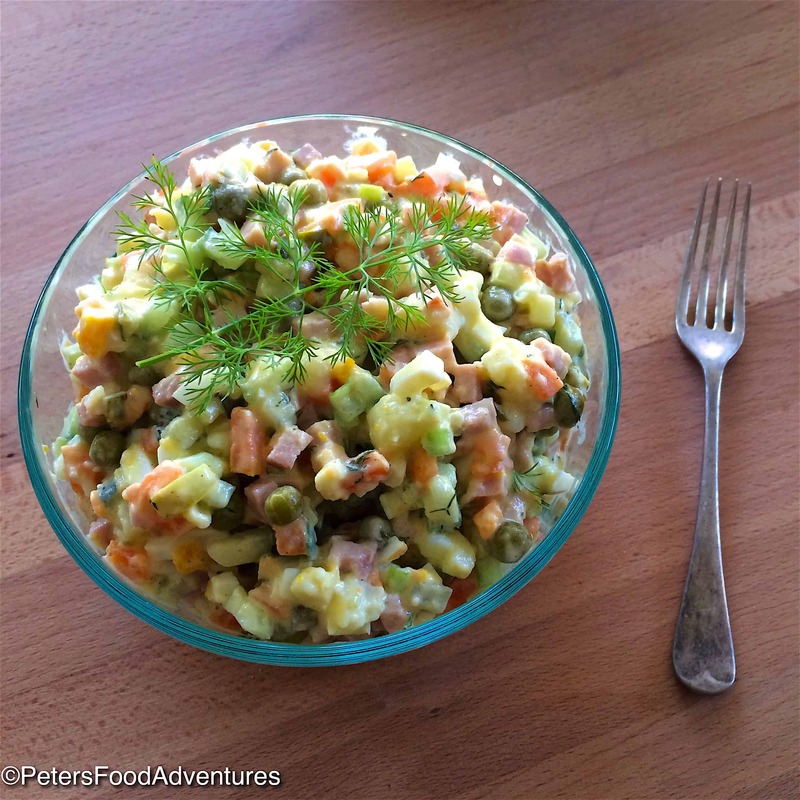 Olivier Salad is a delicious Russian Potato Salad that's popular during the holidays. Around the world it's known as Ensalada Rusa, Rus Salatası, ρώσικη σαλάτα, bramborový salát and more. Perfect for pot lucks and barbecues. Boil potatoes and carrots. Cook until soft, but be careful not to overcook them so they don't turn to mush. Cool the vegetables with ice water. Hard boil the eggs. Cool and peel. Put the ingredients (except peas) into a large bowl. Carefully mix throughout. Taste. Add more mayo if needed. Salt and pepper to taste. Carefully add the peas and gently mix without crushing them. Refrigerate and enjoy! this is very different and sounds really good! eating plain potato salad seems just lazy and boring now! It definitely doesn’t last long in our house! yes this is sure different! My aunt used to make this salad. Yummy! The secret is in the peas. You can forget anything else – don’t forget the peas! I agree! the peas are a must! Apparently some debate on the carrots, but the more veggies the merrier I say! This looks so delicious and healthy! Thanks for sharing!